Edited: ever since the last update, this app freezes every time I open it. I’m no longer able to use the app. Please fix this! I have appreciated studying the word with this app. It's really helpful to be able to read the word and glance over at the study notes without having to hunt for the related note. The app has made Bible study more pleasurable for me, specially since my vision is not that great, so reading a print Bible can be uncomfortable. However, I recently bought one of the commentaries. Ever since, I have had a lot of difficulty figuring out how to display the Bible, the notes, or the commentary when I want them. I think I may have figured it out now, but it literally took a couple of weeks. At first I could just see the commentary, then I was able to get the commentary and the Bible next to each other, but I couldn't get back the study notes. I guess once I figure it out, I will enjoy, but right now, it's annoying. I have used the hardback paper edition this study Bible for years and always found it useful. Especially on controversial passages it is usually quiet fair in presenting differing viewpoints. I was pleasantly surprised at how easy it is to navigate the app version of this very helpful book. I heartily recommend it. I love this app. The only improvement I would like to see is the ability to use my Apple Pencil to write notes. It is awesome to have the study notes to look at as I read the text!! This is an excellent application for phone use. It allows the user to access to the Bible any and all times of the day. If there is a way to see more than one translation at a time, I certainly can’t find it. Using an iPhone X, I can only see one version at a time. I find no access to any help features. Basically, this is not useful to me. Do not like wheel for book, chapter and verse. The old method was much better and a lot faster. Otherwise very good. Is it possible to change back to the previous method of selecting book, chapter and verse? This is the best study bible out there, and I've tried several. The regular Bible app is a good freebie, but this beats the Glo Bible app if you're willing to pay for the extra resources. In iOS this app is terrible. The interface does not allow easy change between translations. If there is way to change Bible translations, it is not intuitive. If don’t need to use more than one translation this is a very good app and access to different books of a particular bible is easy. Love this app. Makes daily bible study so easy. I can see multiple translations and study guides at the same time while I'm taking my own notes. Fantastic. Then, later if I want to remember the study I did that morning on my ipad, I can open my iphone and read it there. Great job. This is a very easy to use and intuitive study Bible. Took me less than 5 minutes to figure out and use the study features and there is so much more. This Bible app is wonderful. The study guide is so helpful and gives you the other places in the Bible on a given story . This app makes it so much easier to study the Bible. I had another Bible app that just wasn’t as easy and helpful to use. So glad I have this one now. When I purchased your bible app I did so believing that you get what you pay for. I tried free apps with the audio feature but it didn’t last long before they shut it off and advised me that I had to start paying for it to continue. So I payed about $17.00 for you’re app and about a week later you told me the same thing. That I would have to start paying to continue the audio feature. I don’t have the words express my disappointment in you’re tactics!! I mean really! A bible company using sneak attack tactics like this! There was no mention of this in you’re add! I will be deleting the entire app within 24 hours and I want my money back!!! I use this app several times a week to check references in scripture. I love that it is always with me. I can't say enough good things about this eBible. It has so many useful features, and I seem to discover new ones or new combinations frequently. I particularly am impressed with how I can go through a chain of notes and cross references by finger touch and then return to my original location instantaneously. When I was having difficulty trying to use one feature, I used Help and got an email response within hours. Clearly a lot of thought went into this product. I love having this bible in my phone and it can tag so many of my good things. While using the app, if my iPad goes to sleep, any open resource on the right side will jump back to the beginning. I have the preachers commentary and some of the sections can be long. If I am teaching and don’t keep my iPad awake, when I resume I’ve lost where I am at. I’ve turn off the sync with bible and that didn’t help. Tecarta’s NIV Study Bible is technically sound, regularly supported, infinitely expandable and easy-to-use. Whether one wants only to read the Word or deeply study and compare events surrounding the scriptures, this application will not disappoint. Make side by side comparisons to other Bibles, navigate to cross-referenced passages, highlight verses, review furnished study notes highlighted by icons, organize and save personal notes, enjoy maps, illustrations, photos and videos ... so much but so usable for ANY user. Though I could write much more, I recommend reading the fact sheet to see if the features meet your needs .. and then having confidence that you can easily use this application even if you’re a technology novice. 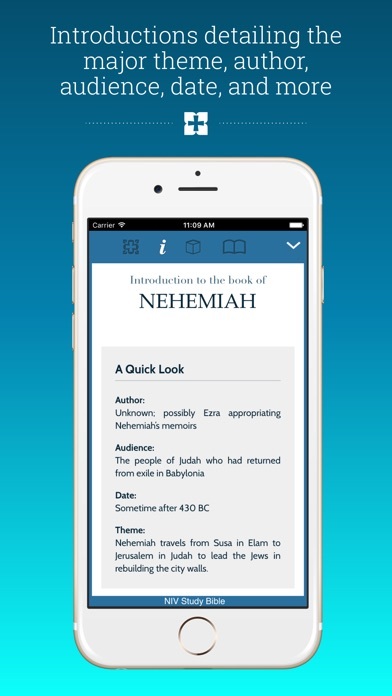 This app is divinely blessed and a great resource for any person interested in learning more from God’s word. It is useful for beginners as well as experienced Bible students. The insights in the commentary are truly inspired and will help draw the reader closer to God if their hearts and minds are open to receiving the message! I feel so blessed! Even though life is hard; knowing that HE is in the heaven waiting for His Own, makes it a great deal smoother. But, mainly I am thankful that you guys made the NIV Bible available online, so everyone who seeks comfort and truth can pick up an electronic iPad and find their God! I have several Tecarta bible versions and was delighted when this Study Bible came out. It has more than exceeded my expectIons. I have the paper version of this bible ($60) and this app has everything the paper version has plus ease of navigation by clicking ref links. The Tecarta bibles are the best out there (I have many to compare them to). I have tried other bible study apps. This is the best. Maps are supreme. User interface is super! Study notes are very good. I've been using this app for several years. Its my favorite app. It's gotten better and better since I first started using it; I look forward to future enhancements! I like that all my study tools are in one place. I can purchase add-on resources within the app, such as devotionals, study Bibles, commentaries, Strong's Bibles. There are so many options! The latest new feature is the verse of the day which I really like. This mobile Bible is easy to read and easy to use. I have enjoyed the daily verses. I love the NIV study bible , it is very explanatory and easy to understand, i love listening to the audio part while i am resting especially when i do not feel like reading i really enjoy the Bible very much with all the included features like highlights etc. I love this system of bible resources, everything I need for bible study. All the different bible translations right at my finger tips. Love it! love it! love it! The combination of features is well organized and assembled. As long as the emphasis is continued accurate presentation of God's word you will prosper. Excellent. Have this installed on several devices and it works well. Notes, highlights, etc. carry over with full fidelity. To me there is no replacement for my Bible. However there are other resources I use in Bible studies and this app is my #1 go-to resource. Many translations at my fingertips. Many features. I use the audio feature for memory verses while I'm driving. This is Bible on the Go for all.I just love it.Very convenient,easy access.There is no excuse for one to say they don't have a bible or can't make time to read.God continue to bless all the brains behind this.A true Revelation.Thank you. I have send different apps but this one is the best one of them all. Very informative. Keep up the good work. May God bless and keep you. 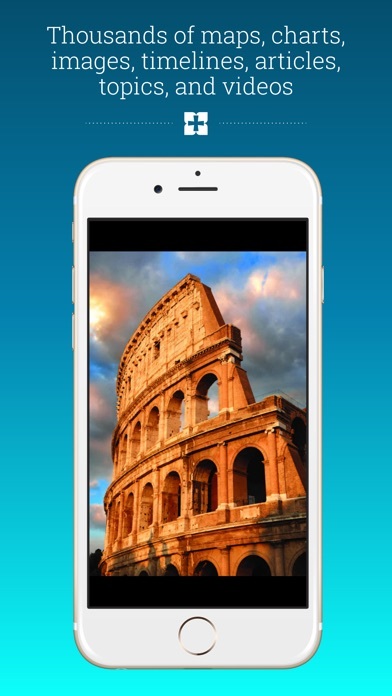 Love the sides-by-side versions to help instantly assist with further understanding! I was so reluctant to pay the money for this app with all the free alternatives out there, but I am glad I did. I've only had it for a couple of hours but I think we're going to be spending a lot of time together. I find this app a wonderful way to read this translation of the Bible. This translation helps me to better understand the King James translation, used in my congregation. The faith of the translators in Jesus Christ as the Savior of the world is apparent. Couple that translation with a world class app and study resources to assist me in learning and growing my faith--what more could you ask for? Thank you! Easy to navigate through, concise, plenty of cross references. Excellent learning tools included for studying God's word. Love the verse of the day feature and the daily devotional. It reinforces my faith, which we all need as a daily reminder of God's love for each of us. It's wonderful to have all this study content at your fingertips offline. Well organized, easy to access all the features. This is the best mobile Bible study app I've ever seen. This app is amazing. The recent updates make this the best Bible app I've ever seen. I've been a customer for years. Many of the things I felt the app was missing have now been added. Now you can see your notes in other versions you've downloaded, and now across multiple devices. That was a huge deal for me, but that is not all you get! Now you can go to their Tecarta website copy all your notes and paste them in Word documents. The old process was painful. Wow that really makes it a great tool when you're creating sermons or a simple lesson to share. You really should consider purchasing this app as they just made this a game changer. You won't be wasting your money. It's now a great value. Thank you Tecarta. This Study Bible is the BEST Bible that I have come across, I have the online (digital) version as well as the leather edition. There is so much information and explanations throughout this Bible, it is very reader friendly and I would recommend this Bible to both beginners as well as advanced Bible readers. Zondervan also makes an audio Bible which is on CD, it is word for word to this Bible and is dramatized, it is great for listening to on the go, so what you start at home, or office, can be continued while running errands or the commute home from work or even while traveling. I absolutely love this Bible in all formats. I do hope that this review helps those of you that may have had some questions pertaining to this Bible.........I guarantee you will not be disappointed. I very much enjoy this Bible app! It has simple and easy applications. Favorite is auto scroll for reading. Excellent bible app. You won't be disappointed. Love this Bible app. Thank you! This makes studying so much easier which makes it more likely that I’ll actually study. And after all, isn’t that what it’s all about? I have the devotional of the day turned on and read that every morning and that gets me started. From there I start cross referencing verses from different books with the easy to follow guides and read notes along the side that help clarify difficult to read passages or give information about the time period. Before I know it I’ve been reading for 30 minutes to an hour. I love it. the book is awesome, but the low resolution of audio bothers me a lot to pay arrentiin to the bible meditation. This ap is so easy to use! I take all my notes on it and I now can do my life group studies without having to find a bunch of papers! I serve in a bilingual church and it's wonderful that the app allows me to have two languages side by side along with notes and other features that are easily accessible and easy to use. All my personal notes, highlights are always there for me to reference and print. I would highly recommend! Once you get the hang of it you can maneuver all over the Bible study notes, etc. These folks did a really good job in putting this app together! This is an amazing app!!!! I LOVE 💘 this Bible version and print. Just like the print version only better. Interactive definitions and commentary. I have this app on all my devices. I use this app regularly for every day Bible usage. Perfect for reading, searching, studying, note taking and posting. There are many bible apps, and I have quite a few on my phone, but this one is my favorite. All the options they provide make you feel like you have your Bible open on your lap with pen in hand. I highly recommend this app. Love the app and what is provides. The capability for specific notes or folders is great. Only improvement item is better instructions for how to share multiple notes at one time. My desire is to "select all" to download all my notes but I can't find instructions to do this, versus selecting each not individually. Easy to use and navigate throughout the Bible. I love how easy it is to click on a verse that is referenced in the commentary and immediately be able to read it. It's also great to be able to select a word and get it's definition. Nice commentary as well. The pictures and maps are a great compliment as well. 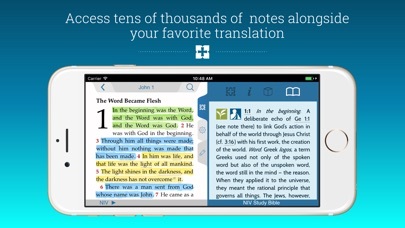 This app is truly an amazing tool for all Christians to use in their daily Bible reading & study. 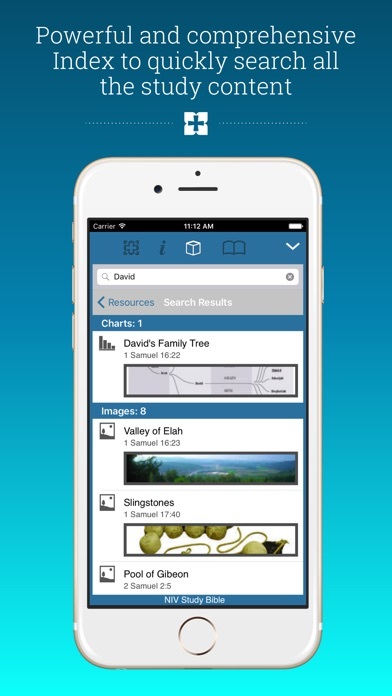 The ability to add different study bibles & devotionals into 1 app is truly exceptional. I use my iPad Pro for all reading. This app gives me everything I want to keep in touch with what is most important. I have really enjoyed using this app. Has good features and good commentary. This is a wonderful bible app. The cross references, definitions, maps and images, and study notes/commentary - it has everything. Very thankful and worth the purchase. I truly love this program. The more I use it the better it gets. There is one thing that would be nice and that would be to be able to write notes with the pen or write in the margins. A real blessing in my life. Struggling with indifference in my life...I thank you for this ‘gift’ of the Bible on my iPad, phone and computer. I really like the new audio reading of the scripture. This is a blessing ! If u need to study the Bible, don’t look further, this is it!